Solving private electricity grid connection projects can bring substantial challenges for protection, control and network synchronisation. 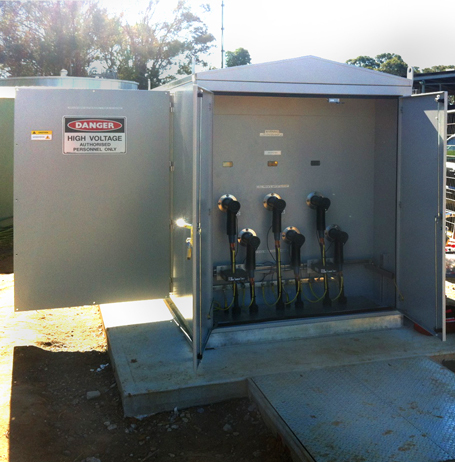 With recent industry growth in Distributed Generation, backup Generation connection and Renewable Energy integration, Brisbane-based switchgear manufacturer NOJA Power have announced a new Ground Mount Kiosk Recloser product. The GMK integrates a standard NOJA Power OSM Recloser system with RC Control, but augments the offering with any additional peripheral sensors, earth switches or protection that is not typically available in a pole top solution. Developed through collaboration projects in the Australia Pacific region with Mining, Private Enterprise and Utility partners, the NOJA Power GMK acts as an integrated solution for connection of distributed generation. 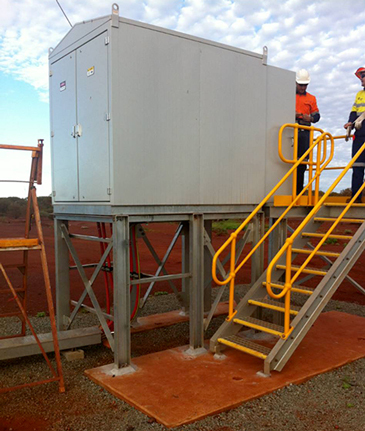 For mining companies, the NOJA Power GMK allows for a semi-mobile installation of switchgear, which can be repositioned on site as requirements emerge. The additional environmental protection offered by the total stainless-steel design ensures that any auxiliary protection or communication equipment is insulated from hazardous environments. A basic single line diagram is shown below, highlighting the use of a conventional recloser as the core circuit breaker, complemented by a manual earth switch on the load side of the equipment. The NOJA Power RC Control system offers a full range of protection, automation and synchronisation capabilities. By placing the NOJA Power OSM Recloser arrangement in the GMK, the connection on site becomes as simple as terminating cables onto the DIN Profile terminals, with all secondary and primary testing completed at the factory prior to shipment. Metering equipment, allowing the full system to be used as a meter point. These augmentations to the standard SLD provide significant flexibility in applications for the product, allowing for a turnkey solution to Distributed Generation and Asset Protection with minimised commissioning requirements. With multiple projects already completed throughout the region, NOJA Power is committed to sharing expertise and supporting Distributed Generation stakeholders in solving their grid connection challenges. If you have a project in mind or would like further information, visit www.nojapower.com.au or contact your local NOJA Power Distributor.